Holy Moly! Chocolate that Tastes Heavenly. Oh, and the Pope Quits His Day Job. A few weeks ago I was introduced to this incredible line of chocolates, made by fancy pants chocolatiers from Ohio. Chocolatiers are people who work with chocolate like a painter works with paint- it is an art, and the medium just happens to be "the food of the gods." Natch, I was at my local neighborhood fancy-pants-chocolate-store in Ballard, enticingly called Chocolat Vitale, craving a proper cup of hot chocolate when the angel who runs the joint, took the liberty in sharing generous chunks of glorious chocolates, and that's when I encountered a big bar of heaven. There is too much to describe my friends, but let's just say, it blew my mind. As in I can not hold a thought in my head when I am biting into this confection. Milk chocolate that is not too sweet, with the boon of being ethically sourced, encases a pocket of delicious caramel. Adding insult to injury, they've sprinkled it with sea salt and toasted coconut, so the mouth encounters sweet/salt, smooth/textures, and explodes with heavenly ecstasy. I'm now obsessed with this bar of wonder. And having put a few under my belt, I'm now praying for some semblance of self control, so as to be able to keep wearing pants in my size. This chocolate bar is mind blowingly incredible. Try at your own risk! You've probably heard the news already. 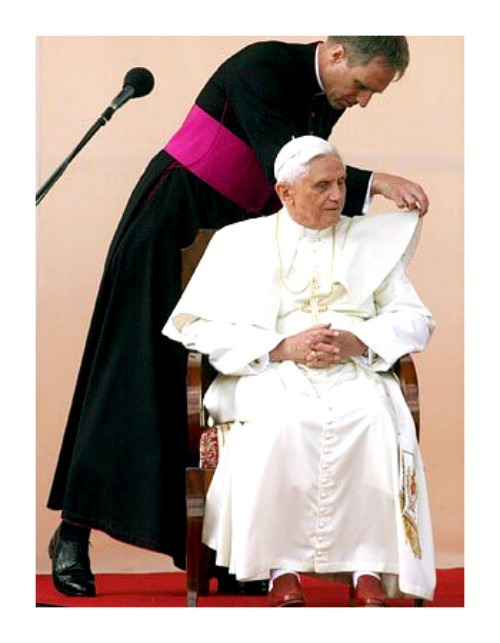 Pope "Chicken Before Eggs" Benedict XVI tendered his resignation. In Latin no less. The Prada-loving pope seemed something of a dandy, and well before the recent headlines, I'd been trying to put together an outfit inspired by his papal pomp and finery. 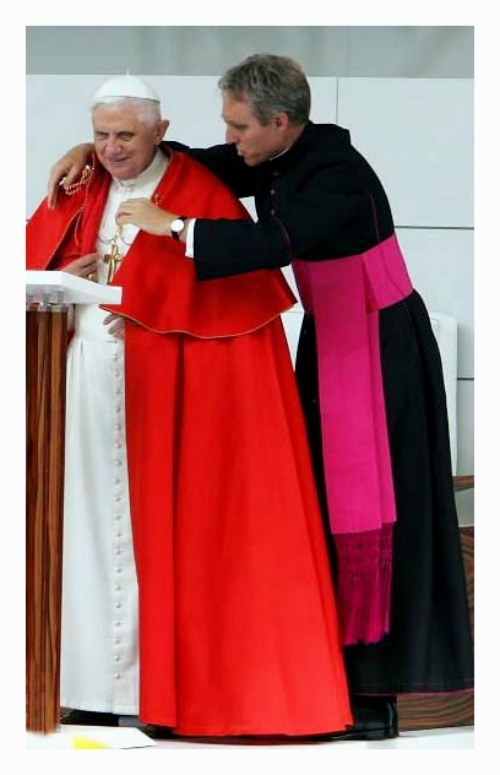 I adore these papal pics; I like the fussiness of his side-kick primping over the pope's ceremonial outfits. Anyways, Papa B quit his day job, is the first Papalian head honcho to do so in a handful of centuries. And that deserves a commemorative outfit, in and of itself. 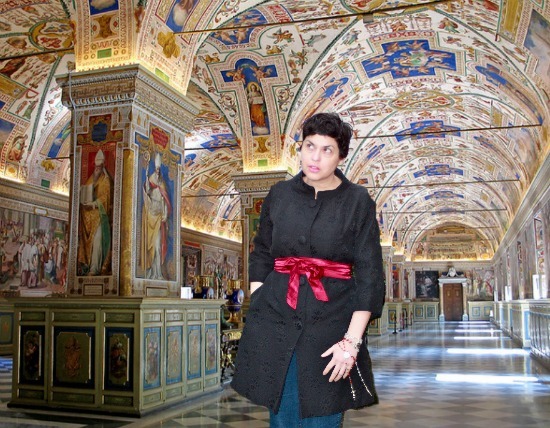 So this is my homage to the popoliciousness of the Vatican. Inspired by the pomp of holy costume, I present to you a series of citizen collages, in honor of the pimpin' papal style. Pope-a-Porter: Papa B Shopping for some Kicks on his iPad. Spiritus inspires, ut sit sancta cogitatione. Movere me Spiritus sanctus opus, sit, sanctificabitur. Trahere animo Spiritum Sanctum diligere nisi ut sanctum. Confirma me spiritum sanctum, ut quae sancta defendimus. Protege me spiritum sanctum, ut sit sancta et semper. Deus qui corda fidelium lumine docuerit Spiritus Sancti dono ut simus semper eodem Spiritu recta sapere, et semper consolatione gaudere: per Christum Dóminum nostrum. Amen. #SHOPSECONDHANDFIRST 99% THRIFTED. 100% RIGHTEOUS. My outfit was created from items already found in my closet. 99% Thrifted. 100% Righteous. Amen. Prada Bless YOU. You've been busy today girl! No wonder you couldn't make the fashion show! When is your return flight due? I'll pick you up! Now, I'm dying for some of that chocolate. Darn you! I hope you're having a great time hanging out with Benedict! Really enjoyed your papal tour, Bella. Coconut, chocolate and caramel - my favorite sweet treats! Salted chocolate caramel is so yum--- never had it with the coconut and as I am already exploding from my clothes these days, I best NOT try it!! Lolzzzz you and the pope!! A must go there come ( what ) May !!! Love the pictures. you are so clever! so looking forward to my trip to Seattle! Silly Pope, messing with tradition! You're in it 'til you DIE, mofo!!! I'm a bit disappointed in him, frankly! But you look hot...maybe that's what caused his meltdown?! I think you should stand for to be the next pope! You are so brilliant, dear Bella, ahhhhhhhhhhhhhh. I wish I was coming with Raquel to see you. bella you made me laugh. i loved this post. and as for chocolate addict is how i'd describe myself. Hi there! Love this post and you look amazing too! I wish this chocolate was available in the UK, it sounds divine! Thanks for the twitter follow, I've followed you back! Have a great week. Ha! I love these pics. Such a cute coat. Love that red sash. Love your papal interpretation and adore the sass! As always, Bella...you are so creative...love the pictures and the tour!! But, now I want to go online and look for job openings in the chocolate business!! How fun would that be! Looking lovely Bella Q. :-)! 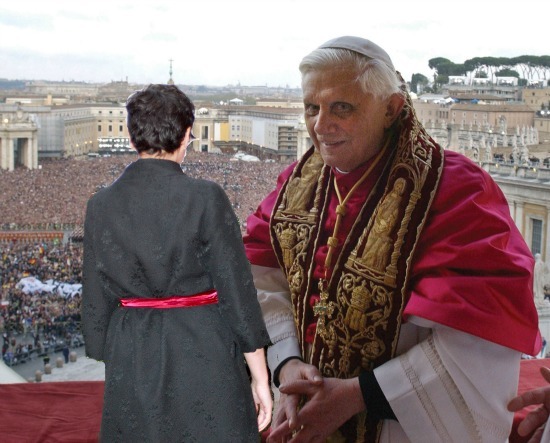 I'm dyin' here, from these pics of you with Il Papa. Two fashion icons!! you make me laugh so much and love that 'papabile' outfit, you look pretty proper for the occasion!, and chocolate with salt is always delightful! Brilliant post! 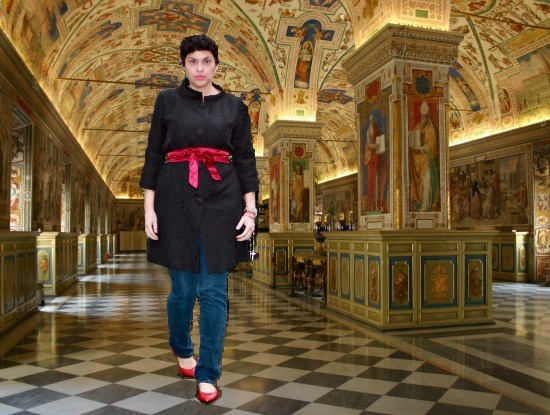 !You look stunning in your Pope-a-porter outfit!Call me next time you will come to Rome! Oh my how COOL!!! love the outfit!!! Hilarious! What's with the bloke? Job for life, living in Vatican City, great uniform, free wine...sounds like a perfect job to me. PS You described that chocolate so beautifully I want some and I don't even like chocolate. those dudes look mighty awesome in those fuchsia sashes. Everything about this post is sheer heaven! 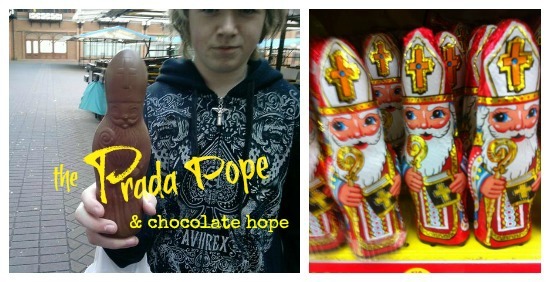 Yes, we need a Latino Pope and women back into the pupil and let add some delicious chocolate to the mix! *queue uncontrollable drooling* haha thanks as always for your super sweet comments, they make my day! So clever! As you state, 'Viva La Glam.' With a little chocolate on the side. I need some of that chocolate STAT. You and the Pope? Love it! Thanks to YOU Clare- I learned how! You made my day! Your Pope outfit is so fabuloso.You crack me up. While it does seem vaguely or possibly outright blasphemous to bite the Pope, you've sold me! When Dear Hubby, who likes to share trending headlines out loud, said the Pope was resigning, I yelped, "Popes don't quit! They die! Er, at least since the Crusades." Poor form I know, but I am kinda a history buff. Plus, you look like you fit right in at the Vatican. Very snappy, lady!